new commercial developments including the well known show and many games. in production. Created by Infogrames, this is one of the few "American"
section. Most of this can be found in the manual. ~ Moves Goku through environments either on the ground or flying. ~ Select options in menu. ~ Interact with a character. ~ Pick up an item. ~ Activates selected Ki attack. ~ Scroll through text boxes quickly. ~ Decline options in the menu. ~ Cycles through available Ki attacks (3 in all). ~ Brings up the in game menu. best to check out the basic strategy section. listed in this section so it's pretty useless. like healing items have to be selected to be used. pretty useless as there are only three attacks anyway. game in the file, you will be prompted to overwrite. Brings up a little list of the developers and engineers. pressing the B button to return to the game. A button to select an option. but it will grow as you gain levels. trying to go through the game as fast as possible. levels as you gain experience. The amount of experience points required to advance to the next level. attack. Nevertheless, it recharges pretty quickly anyway. experience you gain. I'll get into it in the next paragraph. and/or the level gain and experience section. moves. You start off with only one however but learn the rest later on. avoid overusing it or using it when it isn't needed. still will have the same amount of power as if you were at level 5.
monkey), and then use the mallet to hit Gregory (the flying insect). highlight important text that are of course, spoilers. and even healing items that you have already picked up will be regenerated. building as it will have the same effect. beginning cutscene. When you hear a little ding, the code has been activated. his young six-year old son, Gohan..."
is our master seeing in them? makes his way onto the scene. you will come across some stairs leading up to a platform with snakes on it. only herb if you need to. darker part of the forest. As soon as you enter, don't move left or right but forward without turning. pterodactyl. It seems that she has lost her egg. Well, let's help her. would be a good idea to save now in case you die. wish. Talk to both of them to receive 500 experience each! short, that's fine. Continue east and blow up the rocks with a few Ki blasts. wolf here and pick up the stone. After this, you should have three stones. now. However, use the R Button to fly across it. We are near the egg. or two. Now, when you're ready, head back to the mother pterodactyls nest. continue west heading up the steps we took before. notice the man on the small island and the three blue circles in the water. boost. Now, head back to the beginning of the stage. too close. Eventually, it will collapse and 600 experience points is yours. Continue through the path to the west to enter the Forest Village. the man to find out his little girl is missing. Well, let's go then! reaches a grassy clearing. Kill the wolf as you walk as well by the way. house for our final thing to do. Well, his cat seems to be missing. for the time being. Continue ignoring the path south and head up the steps. that we have helped everyone really, the man will open the portal for you. finally. Now, enter the mouth and prepare for Raditz. ready, talk to Raditz to initialize the fight. him to get your son back and 4000 experience! but Goku is gone. Okay, if you have to weep, do it now. (it is sized for the giant) to get onto Snake Way. (well, maybe that is her hair). Talk to her and she'll attack you! falls off the ledge. Uh oh, what will happen now? three in all so let's get collecting! quickly and advance west to find the second spirit. receive another 500 points. The last one is fairly easy to collect as well. charges and fly north and a bit to the left to reach King Kai's planet. Walk north and a bit to the right and you'll meet the one and only King Kai. Along with him is a monkey (Bubbles) and a flying insect thingy (Gregory). the training by talking to King Kai. a chance to hit it and wham! Gregory will protest but King Kai interrupts. much earlier from Master Roshi. Aha, guess some things can't be helped. Anyway, we're off to Kami's Lookout for a little bit. wastelands and fight off the Saiyans. that he can fly to Earth from here. Walk forward and leave the lookout. or anything. More like Siberia or some other northern Russian locale. whatever opposition is in your way and head south to enter the city. don't be afraid to level over the average mark. until you reach the bank. they doing? Sightseeing? Anyway, punch or Ki blast one to start a fight. Watch out for their guns and you should have little trouble. bean. Now exit and head south along the road and exit to the military base. and you will be contacted by King Kai. Well, it's not exactly the military base but what else do I have to call it? man and initialize the fight. unless you make yourself that obvious. rushing. Take your time with solar flare and time your punches correctly. comes up once, that means you beaten Vegeta to a pulp... halfway. fairly easy. I was able to get through this without losing any health at all. However, Vegeta still appears to be alive. smacks the living crap out of Goku just like that. Yajirobe will come and cut off Vegeta's tail! did to Goku knocking Vegeta down pretty easily. the artifacts and place them in the shrine. Hmmm, Goku accepts so exit. nothing you can do about him. Exit and kill the enemies in the area. Here's another place we can level up. pterodactyl for you to kill. It shouldn't be too hard but watch your health. West is another sapling with a guard. Kill him and pick it up. enter the next area, the Namekian Shrine. continue east any further. King Kai will contact you. Continue south and around. Fly to the ledge north and kill the guard quickly. entrance and enter the old building. This temple is like a maze. When you enter, you notice that can't exit. passageway leading to the third and final artifact! you should save the game. brother. Now, continue back down the plateau and head to the east a bit. and Jeice has a lot of that. Just apply the same strategy and you'll be fine. Anyway, Captain Ginyu will get all annoyed and you can finally fight him! Ki blasts but if you are patient, he'll die. Ugh, a greatly annoying part of the game is about to come up pretty soon. Frieza's ship. You appear in front of a building with a guard right by you. guard and a flight charge. Notice the narrow strip of land to the far east. to the east and repeat until you can't go any farther. Along the way, you'll meet a few pterodactyls so be careful around them. east through the path to reach Frieza's ship. all the way to the east and enter the rejuvenation chamber. into the machine to initialize healing. King Kai will wish you luck. final battle with Frieza which is horribly overrated. into his next form which means that you are one third through killing him. solar flares. A few more punches to push him into his final stage! 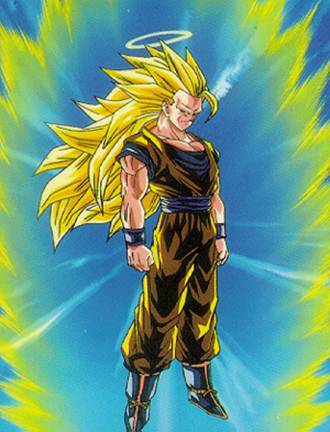 pissed that he turns Super Saiyan! other battle. It's simple. Really! Congrats on beating DBZ: The Legacy of Goku! Enjoy the credits. The End! enemies are listed in order of appearance. tiny experience so just bypass them without worry. Hmm, seafood! But wait, these crabs are just about as large as Goku himself. nothing a little solar flare can't do. enough to down them quickly. him to get your son back although Piccolo kills you. he only needs to charge them for a second before firing. The first boss after a while. Talk to Recoome to initialize the fight. strategy as above and Burter will fall like his brothers. environment turns barren and arid, Krillin will walk and try to protect you. rest of Frieza is weak. There are only a few items so this list won't be terribly long. Herbs are pretty common. They mostly appear in boxes, under bushes, etc. or some dark patches of grass with a bit of red dots (flowers or berries?). You are capable of holding six at any given moment. small so try not to mistake it for another similar looking grass thingy.